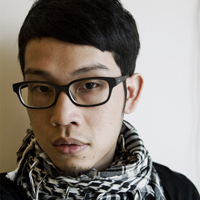 He currently lives and works in Taipei, whose works contain various types, such as sound-image, experimental sound, device and on-site performances. In his sound works, by the way of timeliness sculpture, he records the sounds from environment and digital varied sources and let the exquisite and violent elements co-exist. He tries to find the balance and possibility between simple, environment and complex. Visually, by sound-based original data and extremely tiny unit structure, it develops the visual language and quality itself. In recent years, he has started to cooperate with dancers and artists from other fields and performed in many art festivals in Taiwan and other nations. Beside hearing and visual perception, what else are there? Seems have known, but not really. Sound doesn’t need words to explain. Try to make up for the desire after the degeneracy.